The study (a follow-up from earlier work, Stirling et al. 1999) showed the average weight decline of presumably pregnant, lone females in Western Hudson Bay between 1980 and 2004 was about 65 kg (from ~295 to ~230 kg), “a change that is statistically significant” (Stirling and Parkinson 2006:266). All weights were adjusted to account for the fact that they were recorded on different days (“we scaled weights to a constant capture date of 21 September by adding (or subtracting) 0.85 kg to (or from) the weights of all bears for each day by which their capture preceded (or followed) that date.”). Unbelievably, the number of female bears measured each year for this study was not stated anywhere in the paper. Figure 2. From Stirling and Parkinson (2006), original caption: “Mean estimated mass of lone (and thus possibly pregnant) adult female polar bears in Western Hudson Bay from 1980 through 2004 (dashed line indicates fit of linear regression).” Highest weights were in 1982, lowest in 2002. The actual number of bears measured each year, or the total number, was not stated. Some additional labels are mine. Note that 1992 had by far the latest breakup date (see Fig. 3) but not the heaviest bears. So, between 1982 and 1990 – well before there was any major trend in sea ice cover – 17 bears out of 166 females captured may have been too thin (< 189 kg) to support a pregnancy that year. But even by 2004, the average weight of lone females at 21 September (~230kg) was still well above this “critical” weight for supporting a pregnancy (189 kg). As Fig. 3 below from this study shows, the earliest breakup year occurred in 2003 (second earliest was 1990); latest breakup was 1992 (second latest was 1983) although breakup was also quite late in 2004 as well. 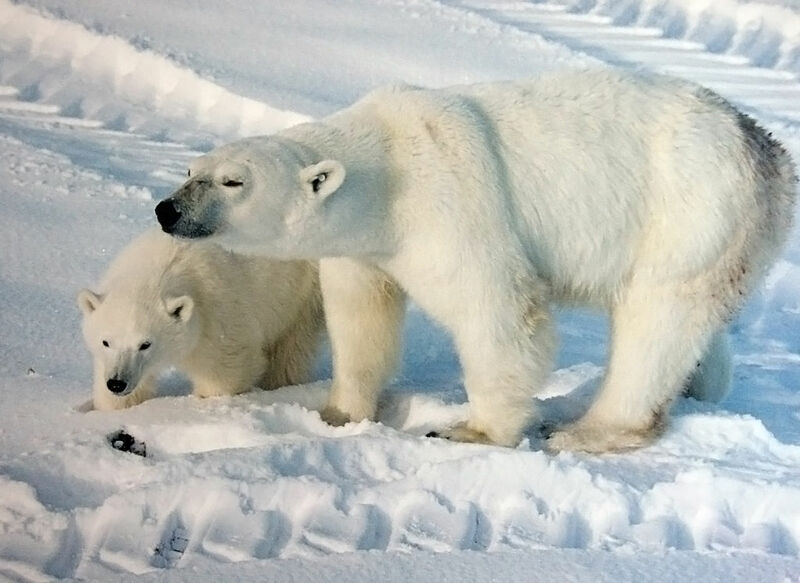 Although female polar bears in 2004 may have been thinner than bears in 1980, they were not even close to being too thin to support a pregnancy, let alone too thin to live. In this case, “thinner” is not the same as “thin” or “starving” – it means slightly less fat. 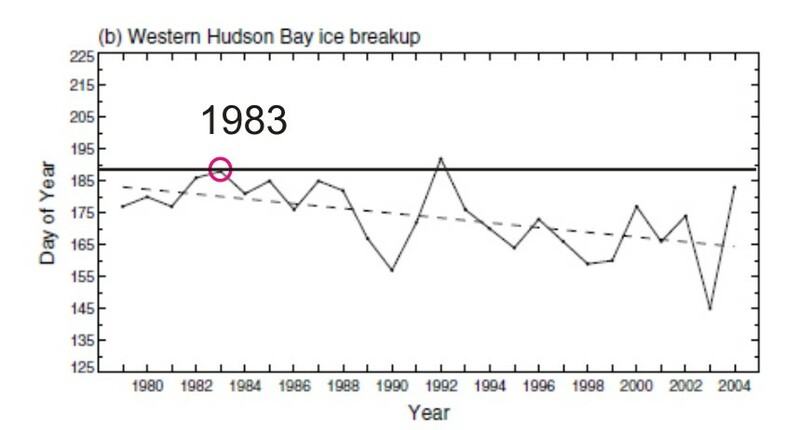 And although there was a “clear overall trend toward progressively earlier sea-ice breakup” and a “statistically significant” change in mean weights between 1980 and 2004, the lowest weights did not occur during years of early breakup and the highest weights did not occur in years of latest breakup – or the year that followed. Correlated trends do not necessarily mean the data themselves are correlated. And, as I’ve mentioned before (here, here, and here), there has not been any new data published since then on the condition of WHB bears, which means these misleading conclusions are also 10 years out of date. 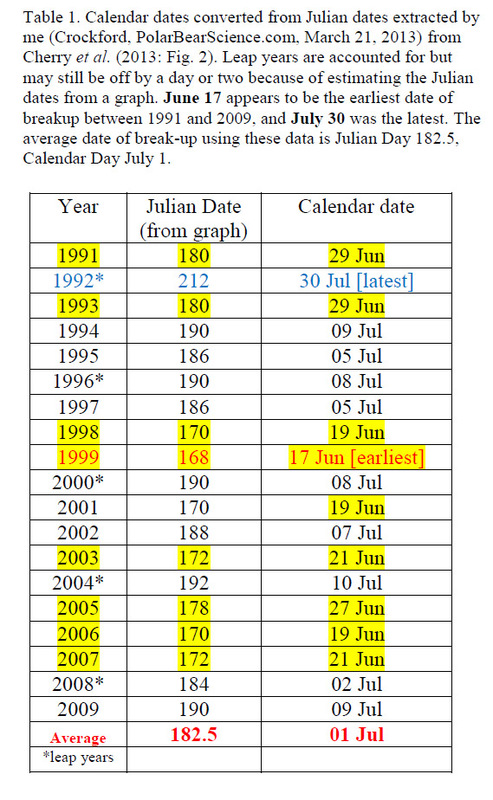 Footnote 1: Breakup dates for 1991-2009 using Cherry et al. (2013) method of 30% ice coverage threshold are listed in Table 1 below. 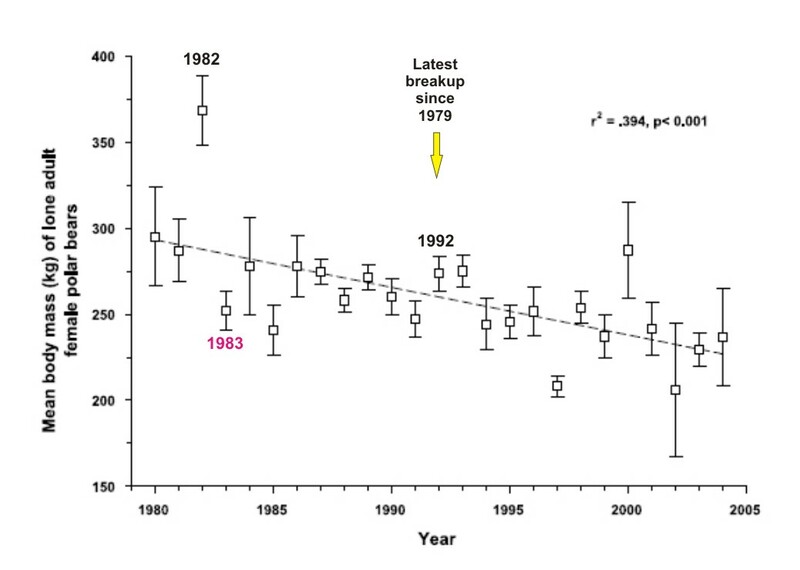 The biggest difference between the two methods seems evident by looking at 1992: breakup occurred (according to Stirling and Parkinson’s graph, Fig. 3 above) on about day 193 (July 11) using the old method but not until day 212 (July 30) using the new method. The new method might have made 1983 (breakup ~day 189 in Stirling and Parkinson) closer to average. This entry was posted in Life History, Sea ice habitat and tagged body condition, breakup, Cherry, climate change, Parkinson, pregnancy, sea ice, starving polar bears, Stirling, too thin, trends, weight, western hudson bay. Bookmark the permalink.